Former Coronation Street actress Catherine Tyldesley has said she was “immediately drawn” to the part of Sara in new Channel 5 series 15 Days. The TV star, who played Eva Price in the soap for seven years, looks steely in the first image from the programme, which is due to air this year. She stands beside co-star David Caves, best known as Jack Hodgson in the BBC series Silent Witness, who cradles a hunting rifle in his lap. Tyldesley, 35, said: “I was immediately drawn into this wonderfully dark story from the very first pages of the script and couldn’t wait to be involved. “Sara is a complex woman at a very challenging time in her life and an absolute gift of a part to play. Channel 5 said the four-part thriller will turn the traditional investigative narrative inside out. 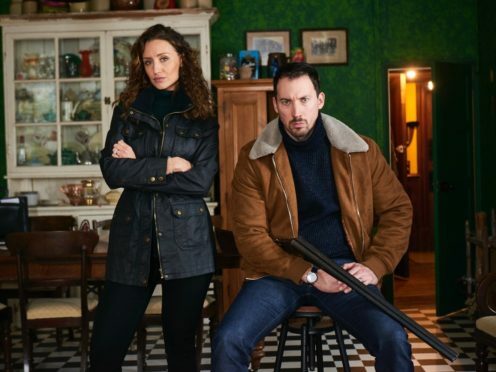 The series is based on Welsh-language public broadcaster S4C’s 35 Diwrnod (35 Days) and is being filmed in Cardiff by Wales-based production company Boom. It features a cast of mainly Welsh actors including Tom Rhys Harries, Sharon Morgan, Geraint Morgan, Aneirin Hughes and Freddy Carter. The show will see a family reunited at their mother’s funeral but tensions will arise over who inherits the family farm. A brutal murder will occur before the action cuts to 15 days earlier and slowly winds forward to the horrific event.